Suddenly Jewish refugees from Arab countries have been catapulted into the headlines. The Kerry peace framework proposals will, it is rumored, contain a clause recommending compensation for both Jewish refugees and Palestinian refugees. This is music to the ears of us activists on behalf of Jewish refugees. It’s what we have been fighting for for decades. At last, the rights of over 856,000 Jews displaced from Arab countries will be recognized and redressed. What’s not to like? Already discordant voices are being heard. In this newspaper, Sarah Honig’s February 13 column entitled: “Another Tack: A Page from Barker’s Playbook” suggested that a reported proposal to compensate Jewish refugees along with refugees from British Mandate Palestine is just a means for US Secretary of State John Kerry to sway the “hawks” of the Israeli electorate – Jews from Arab countries and their descendants. At its core, advocating for the rights of Jews from Arab countries is not about money. Recognizing rights and redress for Jewish refugees is a quest for truth and justice, the prerequisite for true reconciliation between and among peoples in the region. 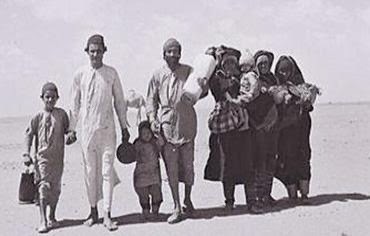 While under international law the legitimate rights of Jews forced to flee Arab countries are neither identical to, nor symmetrical with, those of Palestinian refugees, there is significant linkage between these two refugee populations, underscoring the need to deal with both simultaneously: Both refugee populations were created by the Arab countries’ refusal to accept the 1947 UN Partition Plan and attacking Israel; both became refugees during the same period in history; and both were declared to be bona fide refugees, under international law, by the appropriate UN Agencies – UNHCR and UNRWA. In the international, political arena, Jewish refugees have been inextricably linked to Palestinian refugees. The historic United Nations resolution 242 on the Arab-Israeli conflict stipulates, that a comprehensive peace settlement should necessarily include “a just settlement of the refugee problem,” language that, according to the expressed intent of the UN Resolution’s co-authors, would be inclusive of Arab refugees and Jewish refugees. The 1991 Madrid Peace Conference created a Working Group on Refugees whose mandate was to “...consider practical ways of improving the lot of people throughout the region who have been displaced from their homes” – generic language applicable to both Palestinian and Jewish refugees. The 2002 Road map to Middle East Peace also refers in Phase III to an “agreed, just, fair and realistic solution to the refugee issue,” language applicable both to Palestinian and Jewish refugees. The intention in all of these seminal blueprints for peace is for both refugee populations to be addressed in tandem. So who will pay? There are those who pessimistically believe that compensation for Jewish refugees will never materialize. Surely it won’t come from the Palestinians. And Arab states in the throes of internecine warfare won’t want to pay. Even President Barack Obama may be loathe to pay out from the US’s depleted coffers. Compensation for Arab and Jewish refugees is not a new idea. The concept, which was first proposed by president Bill Clinton in 2000, was for the creation of an international fund to which many states would contribute, including the United States. But Uncle Sam should not foot the bill alone. Multilateral involvement would provide the legitimacy and commitment – as well as financial support – to cement the peace. The G-8, the EU, the Arab League, Arab countries, Israel and others as well – should all participate and contribute. Arab participation is paramount; a genuine peace can only be achieved when all culpable Arab states accept responsibility and express regret for the injustices they perpetrated on their Jewish citizens. "by the appropriate UN Agencies – UNHCR and UNRWA." I am not sure that I would call UNRWA the "appropriate agency", given it is an anomally, created specifically for the "Arab refugees" from within Israel's borders only, and the unique determinations applied to refugee status for that particular group of refugees, including conferring status to subsequent generations. To do that would require the Arab states to correct their history which through now has been the lie that all were equal under the Koran and that all the refugees left of their own accord to be 'Zionists'. And this will never happen.